Use iris recognition as an alternative to entering passwords in certain apps. 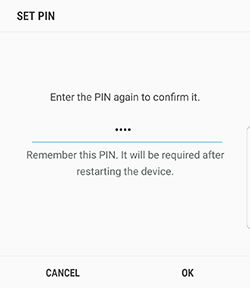 You can also use your eyes to verify your identity when logging into your Samsung account. Important: DO NOT stare directly into the infrared iris recognition LED as prolonged use can cause eye strain. Do not stare at the iris recognition LED light when your eyes are less than 20 cm (~8 inches) away from the device, for best results keep your eyes between 25-35 cm (~10-14 inches) away for optimum recognition. • For better results, take off your glasses or contacts. • Keep your eyes open when you look at the screen. • Avoid direct sunlight; it can affect the iris scanner. • Make sure to keep the camera lens, LED sensor, and proximity sensor clean. 10. Hold the device 10-14 inches away from your face and position your eyes inside the two circles. 12. To use Iris Security, touch TURN ON. You can set the Iris Scanner as the primary method for verification. 5. Enter your lock screen credentials. 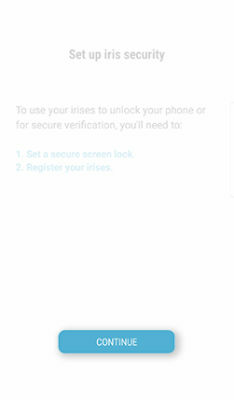 • Samsung Pass: Use your irises to verify your identity using Internet and other supported apps. • Samsung account: Use your irises to verify your identity when making purchases with your Samsung account. 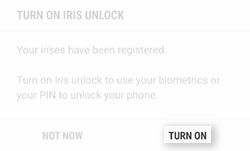 • Iris Unlock: Use your irises to unlock your device. 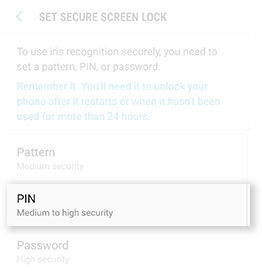 • Use iris unlock without swiping: Use your irises to unlock your device as soon as the screen is turned on, without having to swipe first. 6. Touch Preview screen mask.